The subject on which I would engage the attention of your readers is one which affects the whole character and nature of Christianity, branching out into what is really infidelity on one side, and abominable heresies on the other; but held in its root principles by persons who would utterly reject both. It is found in the most highly-esteemed ministers of the Free Church of Scotland and widely spread in it; in the Baptist Colleges, and taught by eminent Baptist ministers in the United States; elaborately developed in the revived energy of evangelicalism in Germany, whence it has passed in a gross Puseyite shape to the Dutch Reformed Church in the States. Its full doctrinal results were developed in Irvingism. The worst kind of infidelity is based on it, to which the German doctors approach wonderfully near. 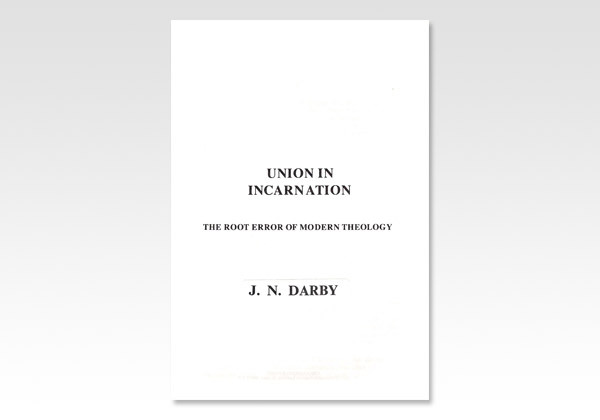 The question is this: Was Christ in incarnation united to humanity to renew it? or is the life of believers a wholly new life in every case, and, in the case of the church, believers united by the Holy Ghost to Him glorified? Those orthodox in the main take up only the renewal of the first man; the fullblown doctrine is Christ's union with fallen man. It is a capital question; because this makes fallen man, the first Adam, that which is taken up of God for blessing as such, to which the Word therefore united Himself, and that (however sinless they may hold Christ to have been personally) in its sinful state, before redemption. The truth looks upon man in the flesh as utterly rejected and lost; that Christ stood alone, though a true and very man, till He had accomplished redemption, and then, when He had accomplished it, a redemption available in justification and life to faith, before as after the cross; that a wholly new nature was given, in which man enters into the benefit of it, there being also in the case of the church actual union with Him glorified by the Holy Ghost, members of His body.